HOLLYWOOD, California, August 22, 2014 (ENS) – “Years of Living Dangerously,” the television series featuring Conservation International leaders as part of an all-star cast exploring Earth’s changing climate, has won the 2014 Emmy Award for Outstanding Documentary or Nonfiction Series. This is a major accomplishment for the first documentary series devoted to climate change to appear on a major television network, in this case Showtime. 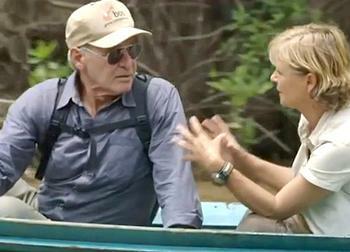 In the nine-part series, Dr. M. Sanjayan, Conservation International’s executive vice president, and actor Harrison Ford, vice chair of CI’s board, help to show the places and people already affected by a warming world. Dr. Sanjayan travels to the ends of the Earth to interview some of the world’s top climate scientists. Ford explores the devastating effects of deforestation. Some communities, companies and scientists are already taking action, finding solutions to the climate challenge. Created by executive producers James Cameron, Jerry Weintraub and Arnold Schwarzenegger, “Years of Living Dangerously” combines Hollywood storytelling with on the ground reporting to show how climate change is felt around the globe. The first episode moves from Syria to the Texas Panhandle, documenting how the lives of ordinary people are changing. Food, water, health, jobs, whole economies – all are at risk as the climate heats up. The 66th Annual Primetime Emmy Awards ceremony held to honor the best in U.S. prime time television programming from June 1, 2013 until May 31, 2014, as chosen by the Academy of Television Arts & Sciences will air on Monday, August 25, 2014 on NBC. SANTA MONICA, California, August 22, 2014 (ENS) – Production company Tree Media has released, “Carbon” a short film narrated by Leonardo DiCaprio. It is the first of four films in the Green World Rising series that will explore the ongoing climate crisis. “Carbon” is presented by Thom Hartmann, a radio host, author, and liberal political commentator and directed by Leila Conners, both of whom were writers on the show. On of three executive producers on “Carbon” is Leonardo’s father George DiCaprio, an American comic book writer, editor and West Coast underground comic book distributor. “Carbon” was made with the support of the Leonardo DiCaprio Foundation. Since 1998, the Foundation has been working on pressing environmental and humanitarian issues through grant making, campaigning and media projects. Leonardo di Caprio currently serves on the board of the World Wildlife Fund, Oceans 5, Pristine Seas, The Natural Resources Defense Council, and International Fund for Animal Welfare. On July 23 in Saint Tropez, France, the Foundation’s first gala event raised over $25 million for conservation. SAN DIEGO, California, August 22, 2014 (ENS) – The severe drought gripping the western United States is changing the land beyond the localized effects of water restrictions and browning lawns. Scientists at Scripps Institution of Oceanography at the University of California San Diego have discovered that the growing loss of water is causing the entire western United States to rise up like an uncoiled spring. Investigating ground positioning data from GPS stations throughout the west, Scripps researchers Adrian Borsa, Duncan Agnew, and Dan Cayan found that the water shortage is causing an “uplift” effect up to 15 millimeters (more than half an inch) in California’s mountains and on average four millimeters (0.15 of an inch) across the west. From the GPS data, they estimate the water deficit at nearly 240 gigatons (62 trillion gallons of water), equivalent to a six-inch layer of water spread out over the entire western United States. While examining data sets of ground positions from precise GPS stations within the National Science Foundation’s Plate Boundary Observatory and other networks, Borsa, a Scripps assistant research geophysicist, detected the same pattern over the 2003-2014 period. All of the stations moved upwards in these recent years, coinciding with the time of the current drought, found Agnew, a Scripps Oceanography geophysics professor who specializes in studying earthquakes and their impact on shaping the earth’s crust. Agnew says the GPS data can only be explained by rapid uplift of the tectonic plate upon which the western United States rests. The research was supported by USGS National Earthquake Hazards Reduction Program. Agnew wants to assure the public that the uplift has “virtually no effect on the San Andreas fault” and therefore does not increase the risk of earthquakes. WASHINGTON, DC, August 22, 2014 (ENS) – After a delay of nearly 10 months, the U.S. Environmental Protection Agency today sent its proposed final rule for the 2014 Renewable Fuel Standard, RFS, to the White House Office of Management and Budget for final review. There has been an intense controversy over this rule between proponents of renewable fuels such as ethanol and those who want the agency to reduce requirements for renewables in favor of petroleum-based fuels. Both sides warn of dire economic consequences if EPA favors the other side. EPA is required by law to finalize the blending requirements for the Renewable Fuel Standard for the following year by November 30, a deadline that has not been met since 2011. EPA Administrator Gina McCarthy said in May that the agency had to review more than 200,000 public comments on its November proposal for 2014 that would slash the mandate from the level set out in the 2007 Renewable Fuel Standard. In November, the EPA proposed reducing corn-based ethanol in 2014 to 13.01 billion gallons from 14.4 billion gallons initially required by the law, which requires refiners to buy alternative fuels made from corn, soybeans, used cooking oil, woody biomass and other products to reduce U.S. dependence on foreign energy. EPA in June extended reporting deadlines for the 2013 Renewable Fuel Standard indefinitely. Office of Management and Budget has 90 days for its review, with a possible extension. The final 2014 rule could overlaw the November 30 deadline for the 2015 Renewable Fuel Standard. Meanwhile, Congress, the EPA and the White House are being subjected to calls for legislative reform by parties on all sides of this issue. In the draft RFS rule released in November, the EPA proposed holding biodiesel volumes at 1.28 billion gallons, a sharp drop from last year’s actual production of nearly 1.8 billion gallons. A nationwide survey of producers conducted by the National Biodiesel Board in April found that more than half had already idled a plant this year and 78 percent reduced production from last year. Nearly two-thirds, had already laid off employees or anticipate doing so. Steckel said today, “We’re pleased to see the process moving forward and hope the final rule will show that this Administration is standing behind our national goals for clean, domestic fuels that strengthen our economy and national security. Produced in nearly every state, biodiesel is made from recycled cooking oil, soybean oil and animal fats. It is the first and only commercial-scale fuel to meet the EPA’s definition as an Advanced Biofuel. The EPA has determined that it reduces greenhouse gas emissions by more than 50 percent compared with petroleum diesel. The biodiesel industry has exceeded RFS requirements in every year of the program. In 2013, it reached a record U.S. market of nearly 1.8 billion gallons and supported more than 62,000 jobs nationwide. MISSOULA, Montana, August 22, 2014 (ENS) – Siding with three conservation groups, a federal judge has rejected a plan to build new logging roads into a 36,700-acre area of grizzly bear habitat in the Stillwater State Forest in northwest Montana. Grizzly bears are federally listed as a threatened species under the Endangered Species Act. The ruling, issued late Thursday, preserves the Stillwater Core grizzly bear habitat from elimination under a plan by the State of Montana that called for building new roads. U.S. District Judge Donald Molloy concluded that the U.S. Fish and Wildlife Service violated the Endangered Species Act by approving the state plan and issuing a permit to the state Department of Natural Resources and Conservation, DNRC, that would have allowed the agency to “take” grizzly bears in the Stillwater Core. In this ruling “take” means habitat destruction that drives the bears out of their territory, leading to reduced reproduction. The ruling comes in a case filed in March 2013 by the public interest environmental law firm Earthjustice on behalf of three conservation groups: Friends of the Wild Swan, Montana Environmental Information Center, and Natural Resources Defense Council. The plaintiff groups challenged federal approval of a 50-year “take” permit and habitat conservation plan that authorized increased road building and logging across 550,000 acres of Montana state lands. The state plan would have eliminated the only unroaded grizzly bear habitat area left on Montana state lands. State land managers proposed to build new roads into the Stillwater Core but claimed to minimize impacts to grizzly bears with seasonal restrictions on road use and logging. “A mother grizzly bear trying to raise young cubs needs a wild landscape, not a maze of roads with complicated seasonal closure rules,” said Earthjustice attorney Timothy Preso, who represented conservationists in the case. Judge Molloy found that federal officials lacked a rational scientific basis for their decision to approve new road-building in the Stillwater Core based on the state’s plan. “The Service has not rationally justified its finding that the approach under the Plan constitutes a complete offset – much less a net benefit – such that additional mitigation measures did not even need to be considered,” he wrote. “Absent independent investigation into the impracticability of greater mitigation measures, the Service’s finding that the Plan mitigates take of grizzly bears to the maximum extent practicable is arbitrary and capricious,” he ruled. The judge upheld federal approval of a different portion of the DNRC’s plan that authorized increased road construction and logging in habitat for the bull trout, an imperiled native fish species. The judge concluded that federal biologists properly issued DNRC a “take” permit for bull trout based on a state plan to inventory and remediate logging roads that are harming bull trout habitat. PULLMAN, Washington, August 22, 2014 (ENS) – In the first study of its kind, researchers at Washington State University are examining whether grizzly bears make and use tools. At least one female bear is demonstrating that she can. 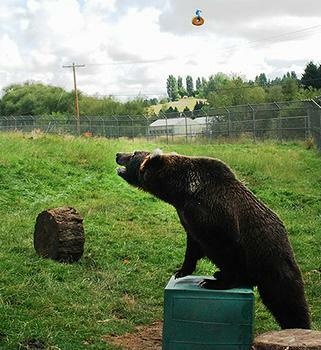 Conducted at WSU’s Bear Research Education and Conservation Center, the study is documenting eight grizzlies faced with the challenge of getting a dangling food snack that is too high to reach. No training is involved. Instead, the researchers are examining innate learning behavior. “While it’s generally accepted that grizzly bears are intelligent creatures, until now no scientific research had been conducted on their problem-solving skills,” said WSU veterinary biologist Lynne Nelson, who is overseeing the study. In a controlled setting, eight bears, three males and five females, are being tested separately and are at various phases of the experiment, said Nelson. A nine-year-old grizzly named Kio has mastered each phase of the test, showing that she is capable of tool use. Inside the bears’ play area, a donut is hung on a string from a wire that is too high for the animals to reach. The glazed donuts, donated by a local grocery, are used to motivate the bears for the study and are not part of their normal diet, said Nelson. First, each bear is tested to see if it will stand on a sawed-off tree stump to reach up and get the donut down. Once this is mastered, researchers move the stump away from the hanging donut and place it on its side. The bear must move the stump until it is underneath the donut, then flip the stump over to stand on to reach the donut. Kio mastered these skills early in the experiment. The other grizzlies are in the process of figuring out the task, she explained. Information from the study can be used to help wildlife managers better solve grizzly-related challenges and problems, according to researchers, and assist zookeepers in enriching the environment of captive bears. “If grizzly bears are capable of using tools to interact with their environment, that’s important for us to know because it provides a fuller picture of how they think,” said WSU veterinary student Alex Waroff, who designed the study and who, with Nelson, tests the bears five days a week. “By better understanding their cognitive abilities, we can help reduce encounters that can turn deadly for bears and humans alike,” he said. Completion of the study is expected this fall.